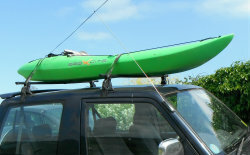 Your canoe or kayak roof rack needs to be as easy and safe to use as possible so that the process of loading and unloading is not a chore that puts you off getting out paddling. We have not only spent years loading and unloading boats but we've also watched and advised plenty of newcomers to the sport as they struggle with the hassle of getting all the right fittings (if only they asked for advise before heading to the hardware store). We've also seen and heard of a few roof rack and trailer disasters or near disasters which have added to our knowledge of "what not to do". If you haven't bought a roof rack yet we recommend you read this first. You need to buy a roof rack designed to fit your vehicle and there are many different versions according to the vehicle you have. For standard saloon cars the cars with roof rails that the rack attaches to always feel like they provide a good strong attachment. However there are a variety of different ways of fitting the bars to the vehicle which are largely determined by the vehicle manufacturer. The bars themselves conme in different lengths. Before you buy the bars think about how many boats you want to carry and what else you might want to carry with your boat or boats. Some bars are narrower than the width of the roof which limits the width you have available for tying to and carrying with. If you can find longer bars that jut out to about the width of the vehicle (or just a little narrower) you will have the maximum carrying width. We have longer than standard bars which allow us to carry three racing boats side by side on V bars (more of them later). 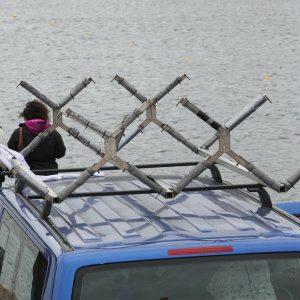 We can also get up to four closed cockpit kayaks or three windsurfers and a closed cockpit kayak on the roof on these bars with the aid of a single vertical upright. When you attach the bars to the car spread them as far apart front to back as possible to give a more stable base for you boat. 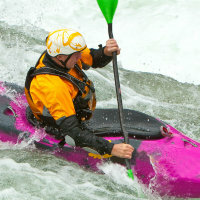 This is particularly important if you are carrying longer boats like sea kayaks or racing boats. You will see inflatable roof racks advertised and on sale. These are inflatable pads with straps that you secure to your vehicle by passing the straps through the doors. They are not designed for very heavy loads but often suggest that they are suitable for carrying kayaks, SUPs etc. They may be suitable for short slow journeys and lighter boats maybe to and from the beach if staying locally but will not be suitable for longer journeys at high speeds. As with all roof bars they will work better on longer vehicles where the straps can be located some distance apart to provide stability. You also need to consider whether you need any additional fittings to use with your roof rack and if so which type. 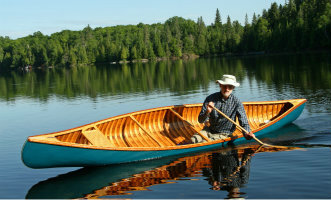 There are a few different types of fitting that make carrying boats much easier. As you select which fitting you want to use (if any) look at how it fits to the roof bars. Not all fittings fit all bars. The V bars commonly used at our club for carrying racing boats come with a standard depth U shaped fitting. This used to work fine until roof bars started coming in oval and different shapes and depths. In spite of trying to offer advice in advance many new paddlers have been frustrated trying to get extra-long U fittings for their bars the night before needing to get their kayak to a race! 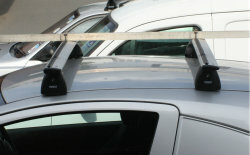 Wider roof bars fitted to car without rails and needing a different fitting to attach V bars. U clamps will not work with these. Our advice is check out all your fittings and how they work well in advance of needing to use them. Your boats will be protected and will be better bedded onto the rack and its fittings if you pad them up. You can buy purpose made pads but pipe lagging taped on with electrical tape does a good job on most racks. 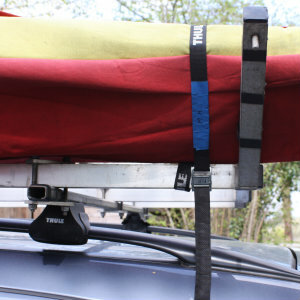 Fitting a single vertical upright will significantly extend the amount you can tie on to your roof rack safely. You might even attach one just to make tying you boat on quickly and securely more easily. 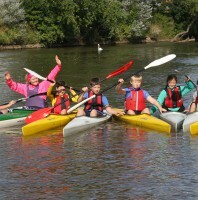 The upright is best if it is a little shorter than the width of the boats being attached. Great tools for moving boats around. Check the law of the land in whatever country you are driving in as regards overhanging boats that are longer than your vehicle you might be required to attach some sort of warning sign to the overhang. We drove through Germany to the Czech Republic with racing boats a number of years ago when there were the terrible floods in Dresden. Its a long story but we were doing a long detour on the way home due to the flooding and as we crossed the border back into Germany we came across a border guard who did not want to let us through with our long overhanging boats! In my school girl German and his hand signals we established he wasn't happy and we could proceed if we cut the front off the boats!!! After many sighs and telling him we didn't understand lots of times he finally let us through but we had visions of what would have been an even longer detour to find another border crossing. A proper warning sign would probably have done the trick. 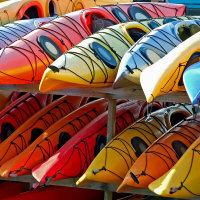 Specialist suppliers will sell you a range of shaped attachments to support your canoe or kayak. V bars are widely used for carrying flat water racing boats, J bars suit a whole range of craft from sea kayaks to sit on tops whilst you will find wedge-shaped blocks or clamps that attach to the roof bars and support the sides of the boat. There are various manufacturers but if you take a look at this Thule website you will get an idea of some of the options available. 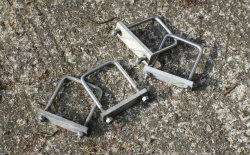 V bar suitable for racing kayaks with padding and fitted to standard bars with U Clamps. 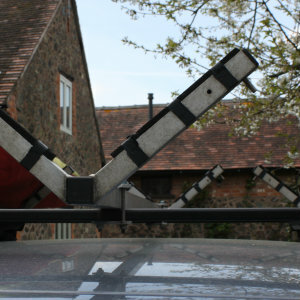 Set of 5 V Bars suitable for 5 racing Kayaks beware of overloading - see how roof bars locate in tracking on roof. Keep straps flat to stop them "singing" on the highway! - See how bars are fitted by clamping around roof rails. Once you have your roof racking set up you need to tie your craft securely without doing it any damage. We find that straps eg Thule straps are the best. Bungee elastics may be OK for a short journey at slow speeds or with a secondary strap for security but they have been known to break on the motorway with dangerous and boat damaging results. Try to put your boat on the rack so that the widest point is between the two strap fixings. This way whether it tries to move forwards or backwards it will tend to get tighter in the strapping as it moves. Don't let your straps twist or you will get lovely humming noises as you go along (quite irritating) and try to set the buckle up so that it is not in contact with the hull of your boat ( unless its a good solid plastic boat). Use up all of the strapping by tying it off again to avoid humming and loose strapping as you drive. Wrapping the long end back around the strap that is fixing the boat in place is a good idea as it will pull the straps closer in to the boats hull tightening everything up. With long boats consider putting a rope through front and back toggles if you have them and securing to a bumper or other fixing point if you have one. Finally check your straps JUST before you leave and give the boats a quick check when you stop on longer journeys to make sure they don't need tightening up.